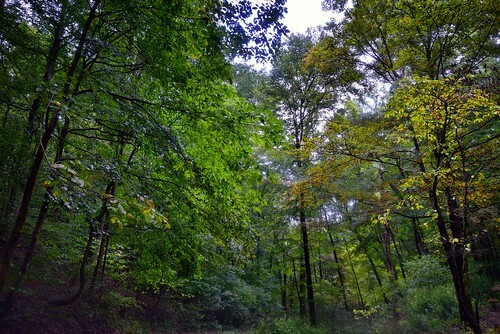 A view looking to the west just outside the main, historic entrance to Mammoth Cave in this portion of the national park. My thinking was somewhat simple when it came to composing this image: angle my Nikon SLR camera slightly upward and capture as much of the tall trees around me as I could. While it would've been nice to have included some of the walkway to my front, I felt the trees above and around me were what truly captured the feeling that I had at that moment. After doing some initial work in Capture NX2 for saturation, brightness, and contrast, I used some CEP filters (Foliage, Pro Contrast, and Polarization) which seemed to best bring out this look even with the overcast skies and off and on drizzle with fog for the final image.